Steam Cream is currently holding a Joy of Giving Contest (Part 2)! All that you have to do is to purchase a tin of Steam Cream and mail them the original receipt and contest form to participate in the contest! 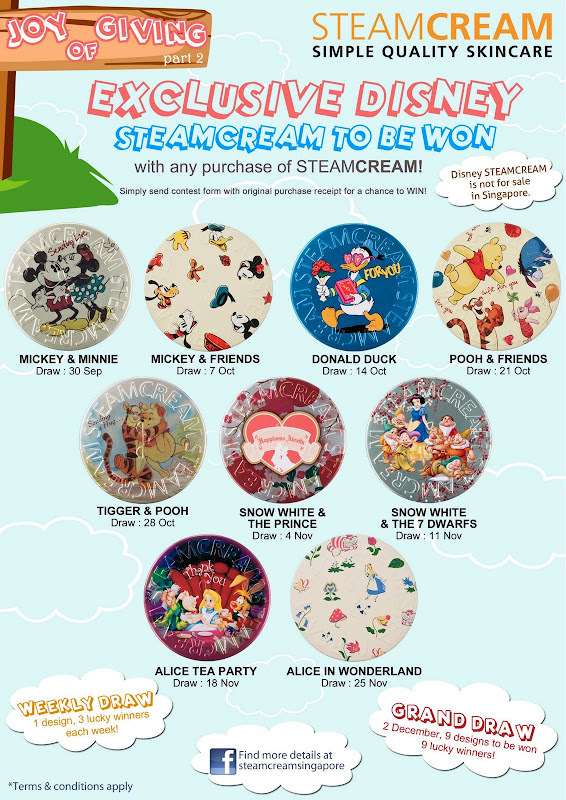 Till November 28th, 3 tins of the Disney-themed Steam Cream will be given away every! A grand draw will be held on December 2nd, where all the 9 different (And I have to add, gorgeous!!!) designs will be given away! And take note, these tins of Disney-themed Steam Cream aren't for sale! Eeps!!! So head on over to Watsons, BHG, Nishino Pharmacy or Unity now! For more details, check out their Facebook page here! For a list of outlets that carry Steam Cream, click here! RAMBLINGS: A masquerade of sorts. RAMBLINGS: Higher Math is beyond me.